The Black Caps had India on the ropes. The ball was swinging, India were rattled, and a repeat of Thursday's drubbing was on the cards. An inspired 10 overs of swing bowling from Matt Henry and Trent Boult had reduced India to 18-4. The combined 23,401 ODI runs of Rohit Sharma, Shikhar Dhawan and MS Dhoni were all back in the pavilion, and the talents of 19-year-old Shubman Gill had been negated. But, after Henry and Boult came out of the attack, the Black Caps lost their edge. Partnerships formed. Boundaries flowed. And suddenly, India had reached 252 – a total good enough for their bowlers, who stopped the Black Caps 35 runs shy, and sealed a 4-1 series win. It never should have reached that point after Henry and Boult had knocked over the vaunted Indian top order, but Ambati Rayudu (90) and Vijay Shankar (45) added 98 for the fifth wicket, before Kedar Jadhav (34) and Hardik Pandya (45 from 22 balls) completed a rearguard recovery. Henry claimed 4-35 and Boult 3-39 from their allotments, and their renewed potency puts the Black Caps bowling attack in a much better situation than they found themselves two games ago, where nobody could stop India's batting dominance. However, the other 30 overs saw just one wicket claimed for 166 runs as India first rebuilt, then attacked. Arguably, New Zealand were a specialist bowler short, and while Colin Munro completed ten solid overs, the other all-round options were either expensive, unthreatening, or not suited to the wicket at Westpac Stadium. While Henry and Boult had contributed a second scintillating spell of bowling to the Black Caps' series tally, there was little for New Zealand fans to get excited about in the five matches. 243 was the best total mustered by the Black Caps batsmen, and after everyone piled on the runs in the destruction of Sri Lanka, questions have now emerged over who can be relied upon against the best at the World Cup. The Black Caps openers have had no answer to Mohammed Shami all series, including the promoted Henry Nicholls, who could only muster eight in his second crack at the top of the order. Once again, the opening partnership failed, and Munro's 24 off 19 balls ended in familiar fashion, chopping on while slashing outside off. An unfamiliar sight, however, was Ross Taylor departing fourth ball, trapped lbw by Hardik Pandya. 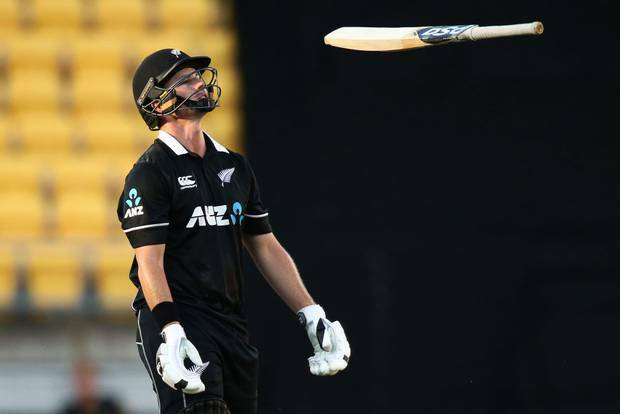 As it turns out, he wasn't out – the ball would have gone over the stumps, but he decided not to review, leaving another rebuild for Kane Williamson to lead. It's been a tough series for Williamson, now having failed to reach 40 in four straight ODIs – his longest such stretch since 2015. He hasn't been helped by coming to the wickets in tricky situations, but his scoring has been uncharacteristically slow, and it hasn't taken magical bowling to dismiss him like it usually does. This time, a half-tracker from part-timer Jadhav enticed a heave over mid-wicket, and he was caught on the mid-wicket rope, for a limp 39 off 73 balls. That ended a promising partnership of 67 with Tom Latham, who once again made an excellent start with 37, but couldn't push on and produce a match-winning knock. That honour looked like it would go to Jimmy Neesham. The powerful hitter raced through to 44, smiting the Indian attack, and reducing the required run rate to less than six an over. What followed though, was a moment of madness. An lbw appeal was turned down, but Neesham – completely unaware – wandered out of his crease, and Dhoni pounced, throwing down the stumps. That left too much to do for the tail, ensuring a drab end to a dreary series.